Executive Express Chiropractic, one of San Francisco's leading no-wait pain relief offices, was recently honored with The Kahuna Content Company, Inc. 2008 Top Blog award. This esteemed recognition, presented by one of the nation's preeminent social media research companies, signifies excellence in the use of social media platforms. Thousands of individuals nationwide visit SFBackPainDoctor.com each month to read up-to-the-minute news, business announcements and professional pain management recommendations on topics including arm, back, neck and wrist pain, Carpal Tunnel Syndrome, Herniated Discs, Degenerative Disc Disease (DDD), yoga, stress reduction, Spinal Decompression Therapy, nutrition and exercise. 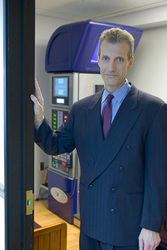 Dr. Davis offers more than 16 years of experience, serving patients at his San Francisco Chiropractor office. He's founder of the Executive Express Chiropractic office providing immediate no-wait treatment for Embarcadero Center tenants, well-known sports and entertainment personalities, politicians and local residents. "We're honored to receive recognition as the No. 1 chiropractic blog in the nation," states Dr. Eben Davis, Founder of Executive Express Chiropractic. "SFBackPainDoctor.com is just one way we work to advance our mission to improve comfort, mobility and quality of life for individuals managing temporary and chronic pain." Visitors can read and subscribe to SFBackPainDoctor.com, with opt-in email updates available and article storage via del.icio.us and Digg This! Blog syndication is also compatible via MyYahoo!, Google, MyAOL, IBLOG Business and Windows Live Alerts. Readers are encouraged to post their own comments, experiences, success stories and responses.